The Tournament Players Club at The Canyons is at once combination of its contrary Nevada surroundings and also the recreational equivalent of its earth-shattering birth. Before architect Bobby Weed and player consultant Raymond Floyd could put their combined skills to work, contractors were busy preparing the site with dynamite. Yes, the TPC at The Canyons, north of the glittering gaming city of Las Vegas, is a blast. It is also a vivid visual wonder. Off in the distance, to the south, shimmers glamorous Las Vegas with all its polished attractions. Look away and the stark mountains and canyons offer a drama all their own. The TPC at The Canyons managed to meld these two juxtaposed forces. Lush green parcels of manicured turf are woven throughout a rugged tapestry of arroyos, barrancas and other natural features in southern Nevada desert. "Desert elegance," it has been called. There could be a no more apt description of the par-71, 7,063-yard golf course that offers a stern test of golfing skills along with stunning vistas. Opened in 1996, the TPC at The Canyons, which has hosted the SENIOR PGA TOUR's Las Vegas Classic in past years, is an integral part of the nation's largest master-planned community, Summerlin. The community also is home to the Tournament Players Club at Summerlin, a private membership club that has hosted the seniors the past two years. The natural elements at The TPC at The Canyons are impossible to overlook. Dramatic scenery abounds, including a view of Red Rock Canyon. Much of the indigenous vegetation was preserved. Some was transplanted. Weed and Floyd took great care in considering the natural drainage when the routing was conceived. But it is the raw landscape within the course boundaries that are most fascinating - and frustrating - for golfers. While the course meanders over several hundred acres, it has only 110 acres of irrigated land - another plus in the realm of environmental conservation and wildlife preservation. There is little wonder why the TPC at The Canyons was the 138th course in the world - and just the second in Nevada at the time it opened - to earn distinction as a "Certified Audubon Cooperative Sanctuary" by the Audubon Cooperative Sanctuary System. Preserving golf balls is up to the player. 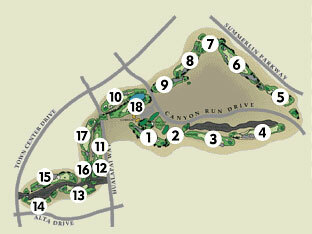 The TPC at the Canyons is a stern test of shot-making, as well as strategy and game management. There is more room than a player might think, particularly off the tees, but throw in prevailing winds and a number of elevation changes and you have a golf course that doesn't have much let-up. Playing straightaway, the opening hole has a generous, wide fairway. The driver is optional as the fairway bunker on the left is reachable. Keep the short approach shot right as the green has a falloff on the front and along the left side. With no greenside bunkers, the opening approach is deceptive. A dramatic, downhill hole playing to a green flanked by a barranca and protected on the right by a greenside bunker. This hole plays a bit shorter than its measured distance, so club selection is a premium. Carry along, slightly downhill par-4 with the barranca on the left. The teeshot should utilize the receptive right slope to avoid the fairway bunker. The green favors a left -to-right approach. Being short is better than being long. A tempting short, downhill 5-par with the prevailing wind assisting. The ideal tee shot is left-to-right down the right side for a view of the green. A narrow opening encourages the player to "go for it," although surrounding greenside bunkers will challenge even the best sand player. The Valley, a medium-short par-4 that plays across a barranca to a wide fairway that narrows toward the green. The short approach is to a green that slopes severely on the front left and is protected by a long deep bunker that should be avoided. A long, straightaway three-shot hole that is quite strategic in design. The tee shot favors a right-to-left drive avoiding the fairway bunkers. The second shot is most important as a plateaued landing area affords a full view of the green. Any shot short or long makes for a difficult approach to a green that falls off on three sides and is protected by a large bunker on the front right. A long hole playing more than the measured distance. A dry wash and bunkers protect the left side, requiring a right to-left shot to a green sloping back-to-front. Bail-out is to the right. The longest 4-par playing uphill into the prevailing wind. A left-to-right tee shot near the bunkers affords the preferred approach. Bailout is plentiful to the right, although beware of the small greenside bunker. Although a short hole, do not let up on this one. The landing area is generously wide if the left fairway bunker is challenged. Otherwise, numerous options exist, playing to a semi-blind green. The green is wide, but not deep and is best reached with a short iron. Another uphill par-4 with a barranca on the left and a generous, wide fairway void of any bunkers. Take an extra club, for the uphill approach shot is into the prevailing wind. The green slopes to the front and is open, receptive to a run-up shot. A testing straightaway par-4 that usually plays into a crosswind. Challenge the fairway bunker for an ideal approach. A greenside bunker on the right can be avoided with a run-up shot to the left of a left-to-right approach. The shortest of the 3-pars, playing to a peninsula green surrounded by desert. A ridge running through the middle separates the green into two levels. An exciting natural hole with a deep arroyo running up the entire right side. Avoid biting off too much as the fairway slopes toward the arroyo. The green is most receptive to a right-to-left approach and has two levels. Another true, natural desert hole challenging the player to bite off the native desert. Ideally, over the left fairway bunker is a good play leaving a short approach to a green that is situated on a ledge, fronted by a unique cavernous arroyo. A wonderful three-shot hole playing downhill and with the prevailing wind, is shorter than the measured distance. Strategy is the key as the second shot must be left of the arroyo, although any bailout will obscure the third shot to a green that is well bunkered. The last of the par-3s, the green is situated on a ridge just beyond a natural barranca. Bunkers protect the right side of the green. An interesting par 4 with natural features abounding. The tee shot is assisted by a large ridge along the right side and protected by a cluster of bunkers on the left. Care should be taken not to carry the drive too far into the grassed barranca as the green is not visible. A left-to-right approach into a green that falls slightly away will inspire some creative shot-making. This finishing hole is a dramatic, downhill par 4. The elevated tee shot shoots over the desert to a tight fairway flanked with bunkers. The approach is to a green protected by water and surrounded by bunkers. Anything can happen here. ADDRESS 9851 Canyon Run Dr.